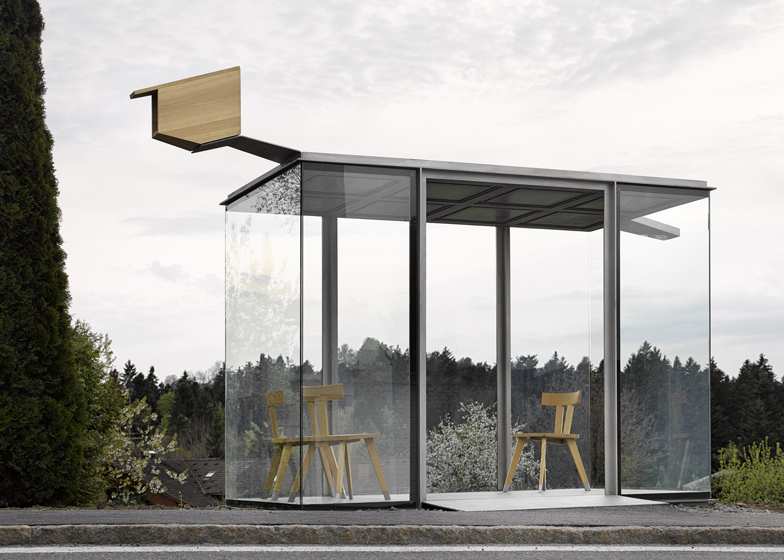 Sou Fujimoto, Smiljan Radic and Wang Shu are among seven international architects invited to design bus stops for a tiny Austrian village in exchange for a holiday there (+ slideshow). The village of Krumbach in the the Bregenzerwald district has a population of around 1,000 people spread over a cultivated landscape. 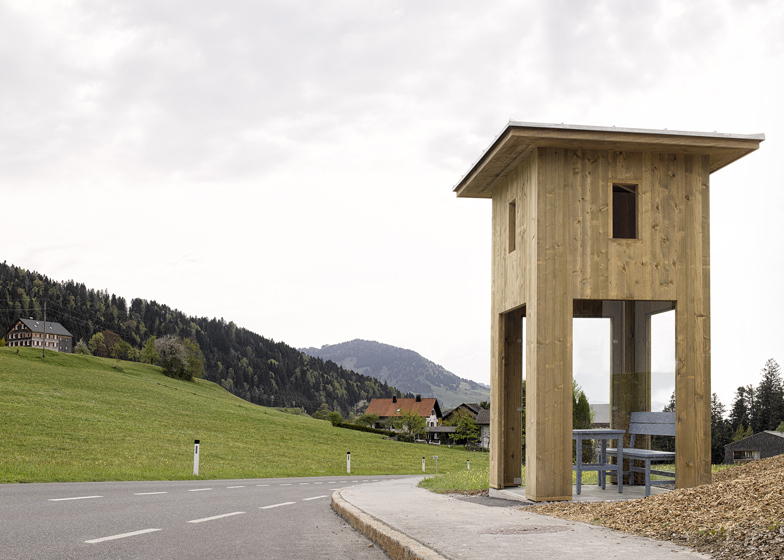 Its recently formed cultural association instigated the Bus:Stop project to boost the number of tourists who already visit the surrounding Bregenzerwald area for its scenery, hospitality and architecture. Hoping to promote an international exchange of ideas, the association engaged seven architects – Japanese architect Sou Fujimoto, Wang Shu's Amateur Architecture Studio from China, Norwegian studio RintalaEggertsson Architects, Ensamble Studio from Spain, Chilean architect Smiljan Radic, Architecten de Vylder Vinck Taillieu from Belgium and Russian architect Alexander Brodsky – to design bus stops around the village. Instead of a typical project fee, the architects were offered a holiday in the Bregenzerwald in exchange for their services. Each also partnered with a local architecture office, who acted as an intermediary between the designer and the local craft-based businesses who built the structures. "The aim of this project is to link design achievements of international architecture with the know-how and skills of local handcraft-based businesses in the Bregenzerwald," explained the project organisers. "This is made possible by involving regional architects as a kind of mediator between 'foreign' creative work and the abilities of our craftspeople." The architect of last year's Serpentine Gallery Pavilion, Sou Fujimoto, created a bus stop that resembles a forest of thin steel rods supporting a winding staircase. 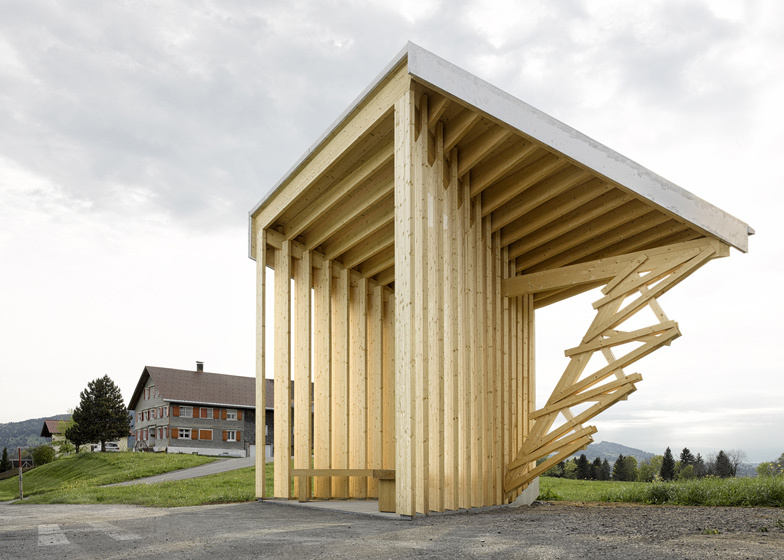 "Our intention is to design a bus stop where people can meet, enjoy the views, and that, furthermore, functions as a landmark in Krumbach," Fujimoto explained. "Both bus passengers and non-bus users can use this bus stop as a meeting point. Everyone may climb the tower-like bus stop to enjoy panoramic views of Krumbach. 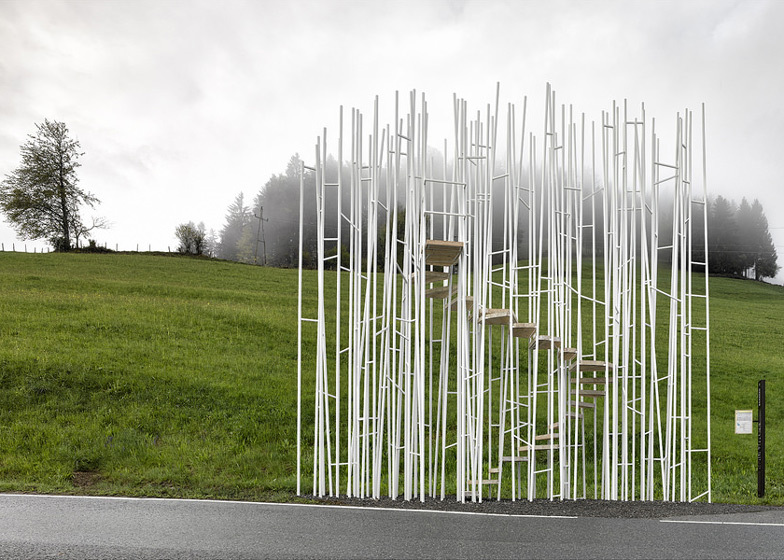 A transparent forest of columns can create interesting scenery in a site surrounded by nature." Pritzker Prize winners Wang Shu and Lu Wenyu of Hangzhou firm Amateur Architecture Studio designed a wooden shelter based on the idea of a camera obscura. "This is a bus shelter, but not merely a bus shelter," said Shu. "It is like a 120 SLR folding camera that people can sit in. It is not only an abstract lens, because the camera is built by local wood and craft. "The lens focuses on the scenery, the symmetrical, the static; sunlight illuminates the interior as gentle breezes filter through it; our gaze is guided to the mountains far away. The symmetry of the camera will undoubtedly trigger symbolic implications, but this symmetry is broken by the sloped eaves at the side." The design by Smiljan Radic comprises a simple glass box based on parlours commonly found in local houses, with a black concrete ceiling to which a wooden bird house is attached. "Urban exteriors seem to be the natural extension of small, protected interior spaces," said Radic. "Zwing bus top seeks to express this domesticity. We have taken the 'mould' of a piece of a 'Stube' and reproduced its beautiful height, its ceiling figures, and transformed its materiality to create a feeling of familiar estrangement." Architects Antón García-Abril and Débora Mesa of Spanish office Ensamble Studio stacked rough, untreated oak planks in an arrangement similar to that found in local timber workshops to create a shelter incorporating benches. 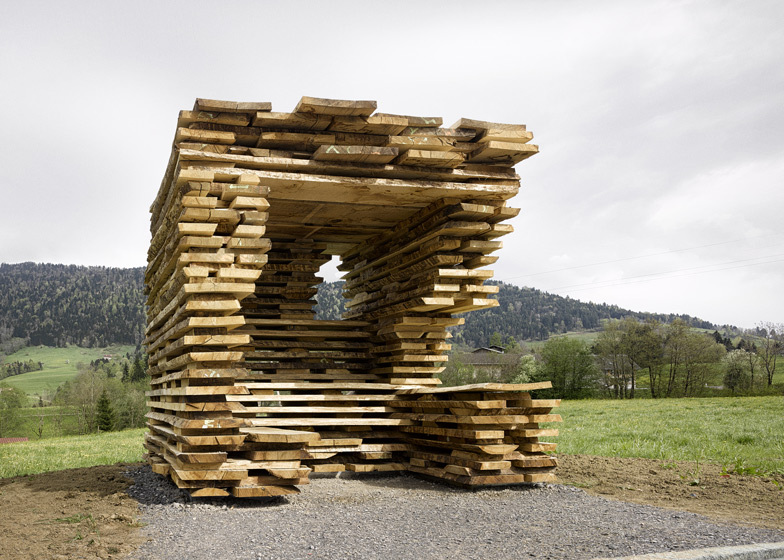 "Ensamble Studio's bus top for Krumbach explores the appropriation of a local technique – used to stack wood planks in the drying barns in the region – and translates it into an architectural space," they said. Belgian office Architecten de Vylder Vinck Taillieu created a folded form influenced by the angular Alpine mountains and a drawing by American artist Sol LeWitt. "A single assembly detail resolves both the mechanics and the rough aesthetics, resulting in a low-res construction process that can crystallise in many forms, ambiguous between the sculptural and the inhabitable. Our bus stop is just one of many possible improvisations," said the studio. Rintala Eggertsson Architects chose a site next to a tennis court for their timber-built bus shelter, which is clad in wooden shingles and doubles up as a spectator stand for the tennis courts. Finally, Alexander Brodsky designed a shelter resembling an archaic tower with an empty upper section and glass walls on three sides that shelter the waiting area. 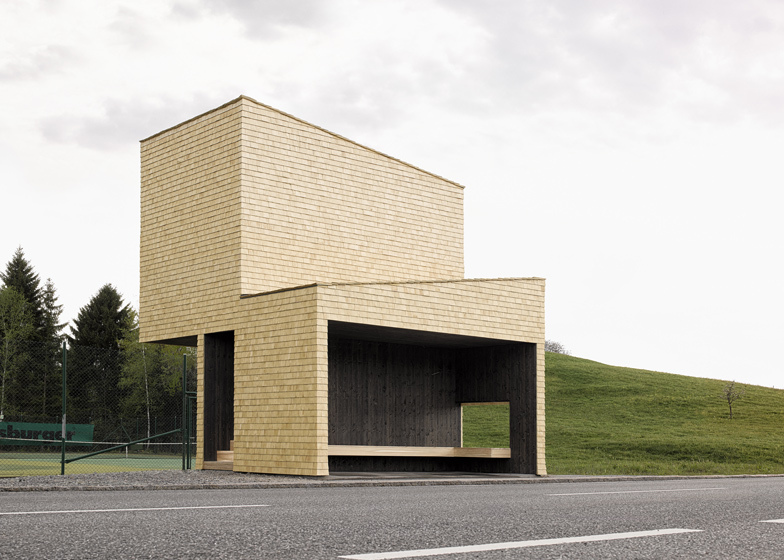 "We tried to design a typical Krumbach bus stop," claimed Brodsky. The project was overseen by Dietmar Steiner, the director of Vienna architecture museum Architekturzentrum Wien. Local private sponsors including hotel and inn owners, craft workers and business people provided the majority of the funding and services to support the process. 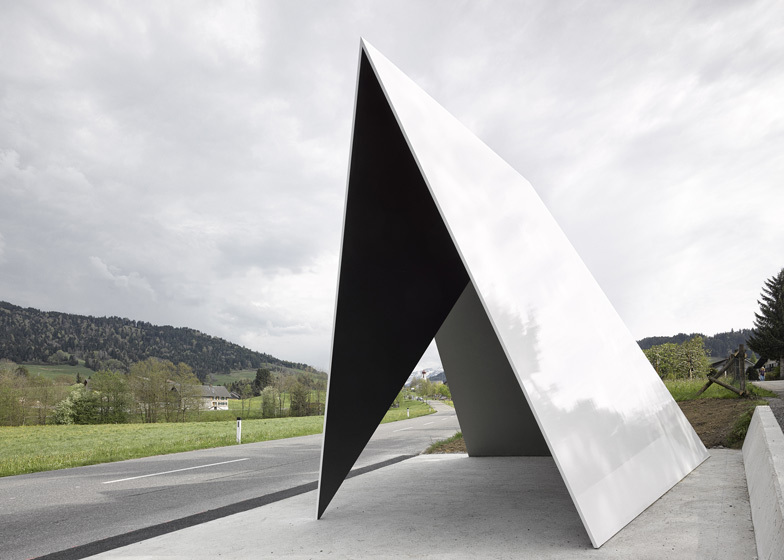 The bus stops were inaugurated on 1 May and an exhibition documenting the design and construction process is currently on show at the Vai Vorarlberger Architektur Institut in the city of Dornbirn. Photography is by Adolf Bereuter.